It’s been too long since we’ve talked. But with learning what it’s like to be a working-outside-the-home-mom, caring for a teething babe, and trying to not drop off the face of the earth as a wife/daughter/friend, blogging just hasn’t been possible for me lately. I’m still trying to figure out how to get back into it, and I expect that it will go much the way so much of my life goes now: in fits and starts, with stumbles along the way. I have a few minutes now, so let’s chat. With only a week left in the “celebrations” season here at Sweet Athena, I figured it’s time for me assess how well I’ve been accomplishing my fall bucket list. Honestly, I don’t remember making such a long list. Ten items is ambitious when taking a shower is still a big accomplishment for me! So, let’s start with what I HAVE done. 1. Decorate the front of our house for the season. Done! I cleaned it up, re-painted the front door, bought a bunch of pumpkins, squash, and corn, and made a wreath for the door. 2. Read Gretchen Rubin’s Happier at Home and complete two projects inspired by the book. Check and sort-of check. It did inspire me to clear out some bookshelves of books I’ve been holding onto from college, but haven’t opened since the last day of class. It felt very refreshing to let go of them. 3. Find a new favorite soup recipe. We riffed on a Greek orzo soup, with flavors of onion, mushroom, spinach and lemon. It was crazy quick to make. 4. Make Murphy his very first Halloween costume. Turns out sewing a baby costume is tricky and I don’t think I’ll do it again. Can you guess what he was? No, not a jailbird. Not Beetlejuice. 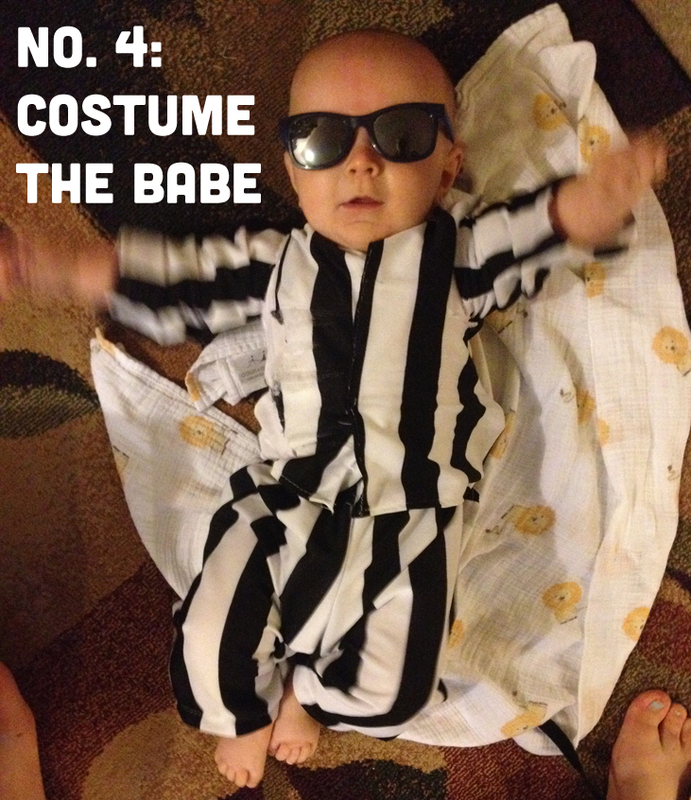 He was Robin Thicke and another baby friend was Miley Cyrus from the MTV Video Music Awards. I’m already embarrassing my son. 5. Go on a date with Dale, sans the littlest love of my life. Thanks to grandparents, we’ve done this a few times: movie, Hanson concert, dinner out. It feels so strange to be with Dale, but without Murph. Despite the oddness of it all, we’ve had fun. 8. Go wine tasting. I didn’t have a chance to go to a winery, but Dale and I did have a late afternoon date down at one of the three wine shops in our little town. 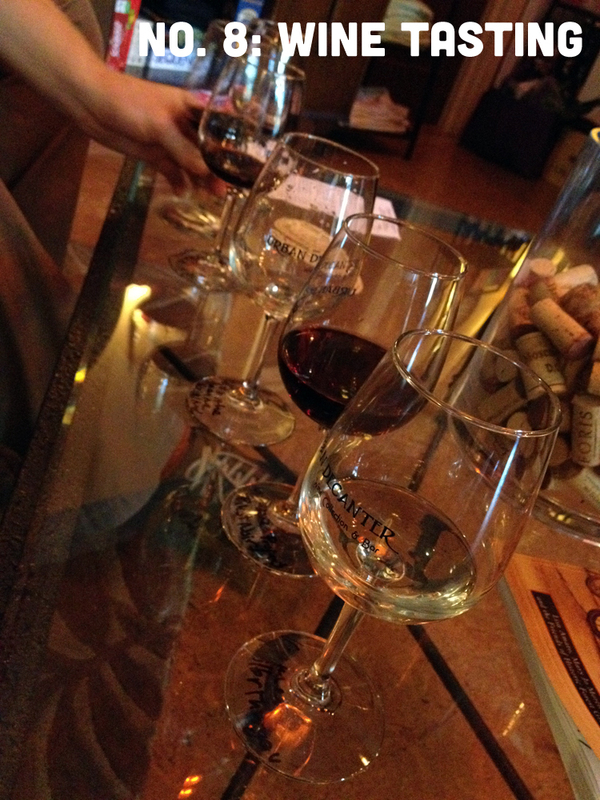 It was incredibly fun: I told the owner what kinds of wine I liked, and she created a delicious flight for me. Plus, we had decadent things like cheese dip and brie and fig sandwiches. Mmmmm. 9. Maintain my very first fantasy football team. I pretty much chose to do this because I know that people I love love football, and come fall, it’s something I can’t really avoid being around. Like they say, if you can’t beat them, join them. Creating my own team has made watching football feel like a big game for me. I secretly love competition, and the thrill of kicking my family’s butts is addictive….although my record is currently just 5-6. Seven out of ten isn’t bad. Actually, it’s better than I thought. But I still have three tasks items fun things to (try) to get done. Something I’m learning as a mom is to not beat myself up if I don’t get everything done, so I’m holding myself to that standard here. These are four opportunities to have a good time and if they don’t get done now, I can always do them in the future. 6. Get an early start on one of those homemade Christmas gift ideas takes one element I’m always too short on: time. Yeeeeeeah. This hasn’t happened. To be honest, I’m guessing this is the one that’s going to pass me by. I might need to let myself have a lower maintenance holiday season this year. Which is to say: no homemade gifts(?!) We’ll see. 7. Hike at least two new trails (stolen from Jess). I totally forgot about this one. A hike sounds mighty nice, though. Maybe this weekend? 10. Discover a new baby-friendly brunch location. I love brunch! I can’t believe this wasn’t the first item I crossed off. We did take Murph to brunch with family a few weeks back, but we dined at a tried-and-true spot. I’m finding that routine is incredibly important for Murphy…and his parents. Still, I think we can probably manage brunch at a new place. I’m probably sounding like a broken record with all of this new mom talk. Sitting down and writing about all of the ways Murphy has changed my life is making it more obvious to me that he has changed my life in so many ways. Life is packed now packed with action. I’m becoming a multi-tasker in ways I never thought possible. Example: I can pretty much follow two conversations at the same time. Weird. While I know that things won’t be the same as they were pre-baby, I wouldn’t want them to be. Well, except for my stomach. (Ugh, I kind of hate myself for writing that, but it’s very much how I feel right now.) So…life is awesome, I’m learning a lot, and I’m doing the best I can in all aspects of my being. I hope to be in touch a bit more soon. If I don’t, I’ll forgive myself. I encourage anyone who has a difficult time doing that to try it out. Trust me, giving yourself grace is tough, but incredibly worthwhile. P.S. In order just to get this post up, I had to skip adding a few pics that are on another computer. I’ll post add them in soon. Something is better than nothing, right? Update on 12/2/13: Finally found the time to add a photo of some of the front porch decor, ceramic kitty and all.